Sen. Harry Brown, who last year received $4,000 in campaign contributions from anti-wind energy billionaires, the Koch Brothers, has filed a bill that would cripple the wind energy along the North Carolina coast. The Onslow County Republican yesterday filed Senate Bill 377, the “Military Base Protection Act,” which would prohibit wind farms in areas that could present a high risk for military training exercises. Based on Department of Defense maps, the bill essentially outlaws wind farms within 100 miles of the coast — a prime area for wind energy. Sens. Paul Newton, a former Duke Energy employee, and Norm Sanderson are the other primary co-sponsors of the bill. Brown and other coastal wind energy opponents say wind turbines present an unacceptable risk to the military and could jeopardize the state’s bases in the next round of base closings. However, the Department of Defense Site Clearinghouse reviews all energy project proposals that could interfere with military missions, and works with states and energy companies to mitigate potential problems. However, at least one military base, Otis Air National Guard in Massachusetts, has built its own independent microgrid using a wind turbine, solar energy and battery storage. No military crashes have been reported with wind farms as the cause. In 2014, a Piper civilian plane crashed in South Dakota near a wind farm, but the FAA attributed bad weather, including dense fog, as the cause. In 2008, a Cessna crashed near a wind farm in Minnesota during bad weather. Federal investigators determined the pilot didn’t have the proper instrument training to fly in those conditions. If it becomes law, the legislation would not affect the 104-turbine Amazon Wind Farm, which has operated in Perquimans and Pasquotank counties in northeastern North Carolina since 2017. That same year, Brown at the last minute inserted language into a clean energy bill that established an 18-month moratorium on new wind farms. The measure was controversial, and nearly hijacked months-long negotiations among Duke Energy, lawmakers and the clean energy sector. The bill eventually passed and became law. The hiatus expired on Dec. 31, 2018. According to 2018 campaign finance reports, Koch Industries, which is run by the Koch Brothers, contributed $4,000 to Brown’s campaign. The Koch Brothers have made their fortune in fossil fuels. Although the Trump administration has said the next closings could occur in 2021, that is speculative. Congress often opposes the closings, known as BRAC for short, to protect bases in their home districts. Nonetheless, the Trump administration has several renewable energy opponents among its ranks. Christine Harbin, a senior adviser for external affairs in the U.S. Department of Energy’s Office of Electricity Delivery and Energy Reliability, came from Americans for Prosperity, a longtime foe of renewable energy. According to DesSmogBlog, which coves climate science, in 2012, Harbin organized Koch Brothers-backed groups to send an anti-wind letter to Congress asking federal lawmakers to end wind production credits. Can you send the Jacksonville NC Daily News a response to this opinion from the Majority Leader of the state Senate published today? The wind industry would have all of North Carolina believe that everyone can be a winner if only we would embrace their plans for developing Eastern North Carolina. I’m here to level with you. The only ones who will win are their corporate executives and shareholders, and those few private landowners who stand to benefit from this taxpayer subsidized industry. Who stands to lose, you ask? The entire state, and Eastern North Carolina most acutely. Advocates for the wind industry don’t like for you to focus on this, but we must discuss the economic impact of the military in North Carolina. Our state, like it or not, depends on Defense spending. According to the North Carolina Military Business Center, the Department of Defense is the second-largest sector of the state’s economy, accounting for 12 percent of Gross Domestic Product. The N.C. Department of Commerce reported in 2015 that the military supported 10 percent of North Carolina’s total employment, amounting to 578,000 jobs and 66 billion in gross state product. Any economic contribution to be made to North Carolina from a wind development pales in comparison to the overall contribution of the military and Defense spending in North Carolina. These are hard, indisputable facts and any attempt to pivot your attention away from these facts should be viewed with suspicion. Can’t wind energy exist alongside our installations? Yes, but like everything else in life, that comes at a cost. Here in North Carolina, the price to be paid is the highly valuable airspace and training ranges that we have worked so tirelessly over the years to protect. Our installations are only as valuable as their ability to ensure the readiness of our service members, which is premised on their ability to train. When we chip away at that ability to train by encouraging development and incompatible use of the surrounding lands, our bases lose their value to the Services they support. Why does it matter whether one of our installations loses value to the Army, Navy, Marines or Air Force? That loss in value will be reflected in Base Realignment and Closure (BRAC) decision-making. All that matters to a BRAC Commission is whether the military can continue to do its job at its current location. If an installation reports that their ability to train has been compromised, a BRAC Commission will find somewhere else in the country for them to train. The loss of any single installation in North Carolina would be devastating for its host community and county, and would reverberate across the state as a whole. There is no wind energy project that could replace that loss, and it would be felt for generations in the future. Haven’t the Department of Defense Clearinghouse and the Federal Aviation Administration already determined that wind development isn’t a threat to the bases? Not exactly. There is a federal process that any wind development must pursue before construction, and that does involve a determination of no hazard from the FAA. With the Clearinghouse, where a development presents a concern to the military, the military must enter into a mitigation agreement with the developer. Even though a mitigation agreement in most cases can be reached, that doesn’t necessarily mean the development isn’t problematic. It means that a solution has been reached that allows each party to merely co-exist. It does not mean that the installation is as well-situated as it was prior to the development. It is, moreover, not a part of the Clearinghouse’s process to consider future viability of the installation for BRAC purposes. That job of protecting the installations from a BRAC falls on NC legislators. We would be utterly negligent if we didn’t approach this issue with a BRAC mindset. What about that Department of Commerce study? Since 2017, new wind developments have been on hold while the Department of Commerce and multi-national engineering company AECOM consulted with the military to develop a map showing areas where tall structures pose a “high risk [of] degrading safety and the military’s ability to perform aviation training.” Those areas are the only ones that would be off-limits for development under my bill, S377 titled the Military Base Protection Act. The map was publicly available on the Commerce Department website, but they have now blocked it. The public can no longer see the map. I encourage the Department of Commerce to restore transparency to these discussions and this process. I also encourage all North Carolinians to take a pause and consider what the military means to this state and where we’d be without it. 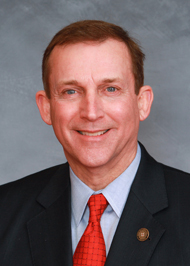 Senator Harry Brown is currently serving his eighth term in the North Carolina Senate representing District 6 – Jones and Onslow counties – and has served as Majority Leader for the past nine years.